The Allwood Manor Pumping Station was originally a submersible pumping station with a wet well depth of 32 feet. The great depth made pump removal even more difficult than with a typical submersible pumping station. Wm. F. Hill & Assoc., Inc. was tasked with designing an upgraded pumping facility that utilized suction lift pumps so that routine maintenance did not require a crane. Due to the extreme depth of the influent raw wastewater gravity sewer and a reprime lift limit of about 21 feet, the suction lift pumps needed to be sited below grade. 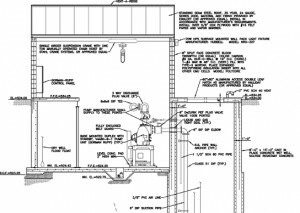 The final design incorporated a pump building with a sump almost 10 feet below grade, an entry platform/walkway where electrical controls are located, and a rectangular wet well. The design also provides space to add a third pump for increasing the pumping capacity of the facility. 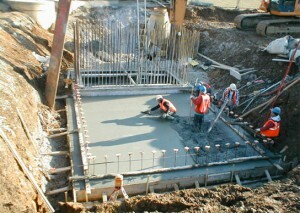 Pump Station Building Slab Concrete Pour. Allwood Manor Pumping Station Design. 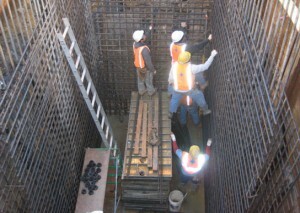 Rebar & Form Work for Wet Well Concrete Pour.